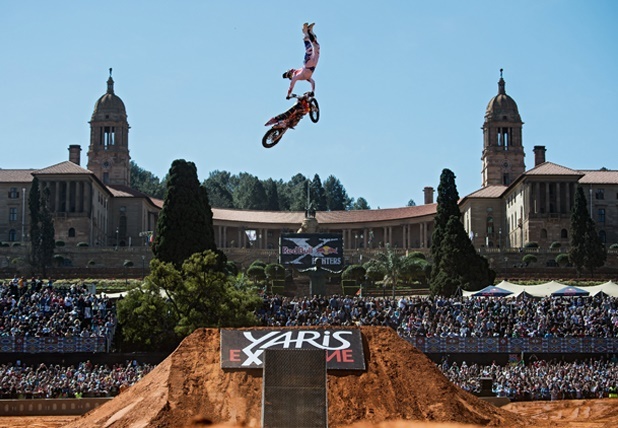 4 things to look out for at X fighters Pretoria! Created back in 2001, the Red Bull X-Fighters concept has grown to become the biggest and most respected freestyle motocross tour on the planet, featuring the world's best riders throwing down mad tricks in stunning locations across the globe. Here's what to expect at the Pretoria leg. The X-Fighters World Tour takes in some of the most iconic monuments and attractions in the world, choosing to stay away from 'regular' motorsports venues. This makes for spectacular imagery, adds something special to the competition and – best of all – creates a helluva vibe around the spectacle...it also means sold-out events. The Union Buildings will be no different, get your tickets now to avoid long faces and #FOMO for years..
What's that saying about 'once in a lifetime'? Performing on the world stage, against the best, in front of your home crowd. In between travelling the world for exhibitions and doing his thing with the Nitro Circus Live Tour here in SA, Nick has been dialing his act, spending countless hours on the practice ramps, clocking kilometers on his mountain bike and throwing weights around in the gym. The man is ready. Expect, well, BIG things. South Africa's Nick de Wit and Frenchman Rémi Bizouard ride a picture-perfect sundown session ahead of the Pretoria tourstop. Five questions with Red Bull X-Fighters judge and FMX legend Drake McElroy.